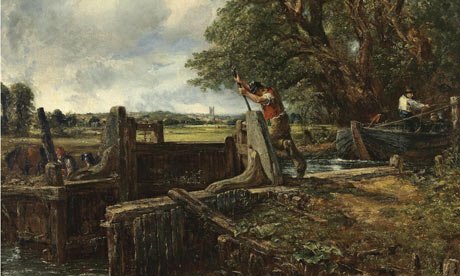 John Constable’s The Lock, owned by Baroness Carmen Thyssen-Bornemisza, is expected to become one of the most expensive British paintings ever when it is sold at Christie’s in London later. The depiction of rural life in Suffolk is tipped to fetch up to £25 million ($40 million). Baroness Carmen Thyssen-Bornemisza said it was “very painful” to sell the 1824 masterpiece but had to because she had “no liquidity”. The work has been housed in Madrid’s Bornemisza Museum, one of whose board members has resigned in protest. Museum trustee Sir Norman Rosenthal criticized the Baroness, known as Tita, for putting one of its prize exhibits up for sale. In his resignation letter, the former exhibitions director of London’s Royal Academy said the decision “represents a moral shame on the part of all those concerned, most especially on the part of Tita”. The top price of £49.5 million ($79 million) was reached in 2002 by Sir Peter Paul Rubens’ painting The Massacre of the Innocents. While most of it was sold to Spain, 250 artworks are still in the Baroness’ private collection and have been lent to the country free of charge for the past 13 years. Announcing the sale of the John Constable painting in May, the Baroness said she needed to sell because of the current economic crisis. “It’s very painful for me, but there was no other way out,” she told the Spanish newspaper El Pais. “I need the money, I really need it. I have no liquidity. Francesca Von Habsburg, the Baroness’s stepdaughter and another museum board member, has also expressed disapproval over the sale. “The baroness has shown absolutely no respect for my father and is simply putting her own financial needs above everything else,” she told The Mail on Sunday. Last month Joan Miro’s 1927 work Peinture (Etoile Bleue) sold for more than £23.5 million ($37.5 million), a record for the Spanish painter. In May Edvard Munch’s The Scream became the most expensive art work ever sold at auction, selling for $119.9 million in New York.